HARTSVILLE, S.C. – The team from No Limit Promotions is back in action this weekend with the Triple Crown 25’s at famed Darlington Dragway. 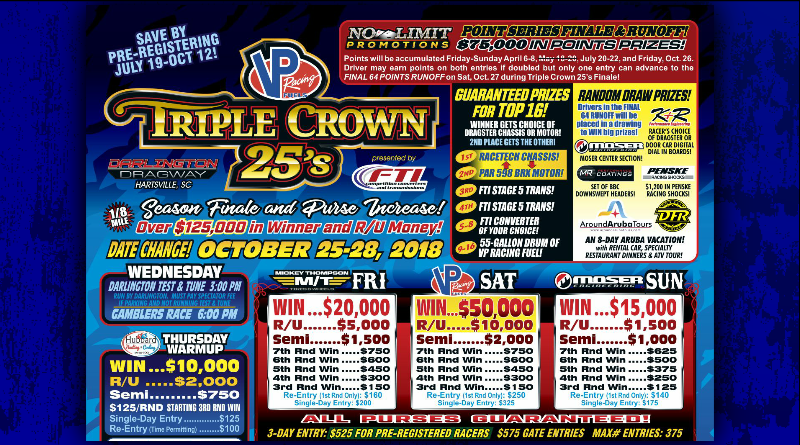 The event kicks off with a $10,000 to win Warm-Up race on Thursday followed by a $20,000 to win event on Friday, the $50,000 to win main event on Saturday, and a $15,000 to win finale on Sunday. Racers are also competing for the season long points championship where the winner will choose between a Racetech chassis or a PAR racing engine. In addition to the season points championship, there will be random prize give aways throughout the weekend and a racer appreciation party on Saturday night. Included below are the event flyer along with the live video feeds from Darlington. DragChamp is your source for big money bracket racing results. Visit DragChamp daily for the latest drag race results from across the country.